Known as the GO Home, the prototype was built by G•O Logic architect Matt O’Malia and Belfast Cohousing member Alan Gibson. The award was presented at the 2011 Greenbuild International Conference & Expo in Toronto on October 6. The USGBC represents 16,000 member companies and organizations and oversees the LEED (Leadership in Energy and Environmental Design) certifications for green buildings. 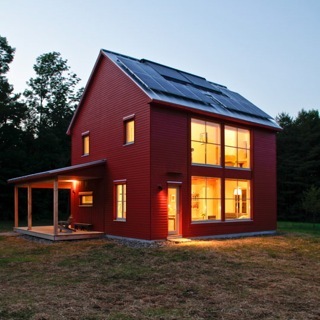 The GO Home is rated LEED platinum (USGBC’s highest designation), and is Maine’s first Passive-House-Certified home, a 1500-square-foot elegant and functional model of the German Passive House Standard. The Passive House standard requires 86% improvement on a home’s space heating loads compared to the typically constructed home. As designers and architects, we need to be conscious of practical and efficient construction materials and techniques. Sustainable design is now on everyone’s radar, so we need to go beyond it. We need to make sure that the building TYPES that we design are sustainable. Cohousing is one very good example of a building type that works for our modern lifestyles. We are having kids older, staying single, or becoming single, and leading very long lives. The single family home no longer works as an isolated castle. Cohousing allows people to maintain the privacy they cherish, while also having the option to be social and join a larger community at any time they please, something most if not all current housing types disregard or omit. For a dose of good common design sense read Creating Cohousing: Building Sustainable Communities by Katie McCamant and Charles Durrett.